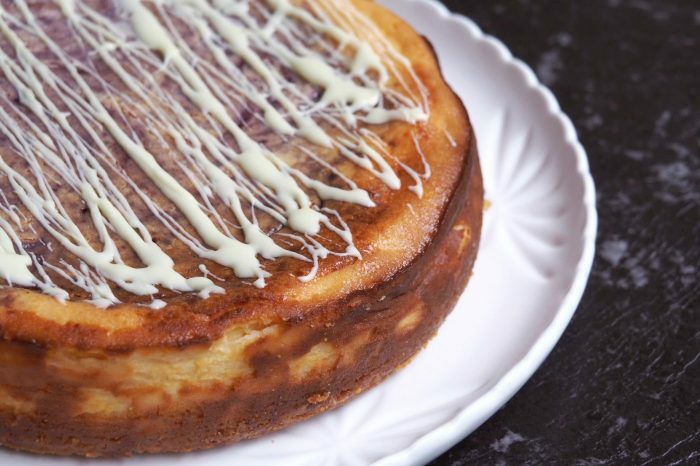 I love me a baked cheesecake and this is one of my favourites. 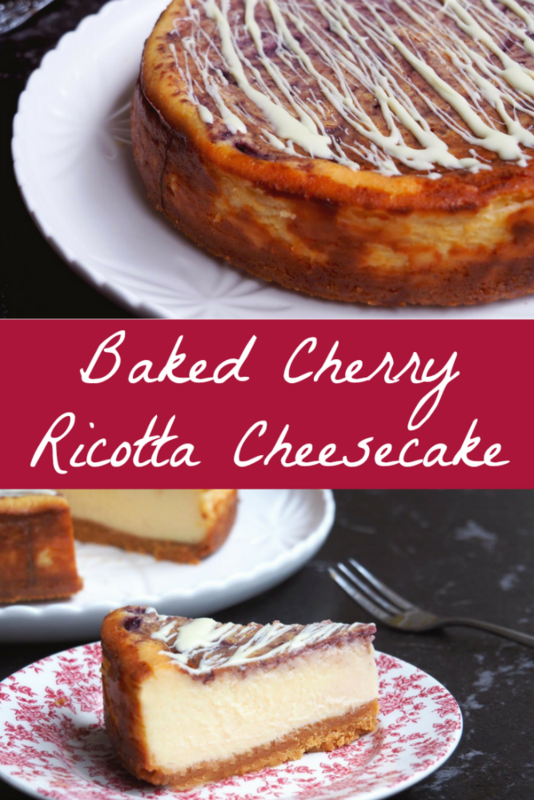 It’s the magic mix of the ricotta, cream cheese and condensed milk that sets this cheesecake apart, making it deliciously rich in taste but oh, so light in texture. 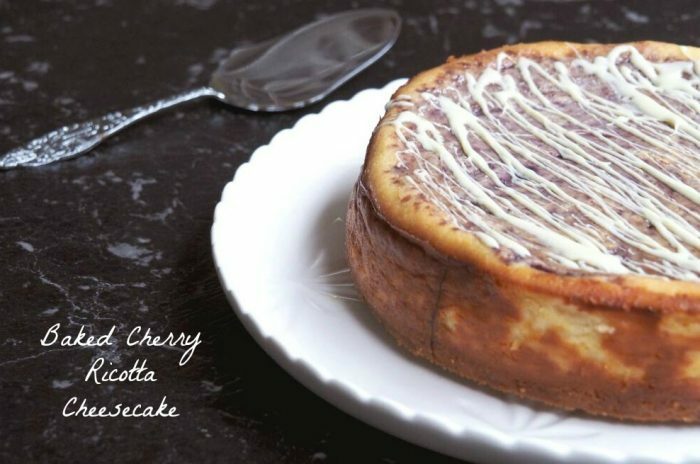 Of course, the cherry swirl makes things extra pretty, and that white chocolate drizzle? Well, it’s just the tops! You can mix things up if you like and use chocolate biscuits for the base and a dark chocolate drizzle for the top. Now wouldn’t that be nice?! This recipe was most deserving of it’s photographic makeover and value added Thermomix conversion because it’s a real plate licker! Preheat oven to 160 C/140 C fan-forced. Grease the sides and line base of a 20cm springform pan. Place biscuits in a food processor and process until fine crumbs. Melt the butter , add to the crumbs and process until well combined. Using the back of a spoon, press the crumb mixture into the base of the prepared pan. Chill for 15 minutes, until firm. Using an electric mixer or food processor, beat the cream cheese, ricotta, sugar, condensed milk and vanilla essence until smooth. Add eggs and beat until well combined. Pour the mixture into prepared pan. Place cherries in a jug. Using a hand blender, puree cherries until smooth. Using a teaspoon, dollop half of puree onto cream cheese mixture. Using a skewer, swirl through the batter. Bake for 50 minutes, until just set, but slightly wobbly in the centre. Turn the oven off. 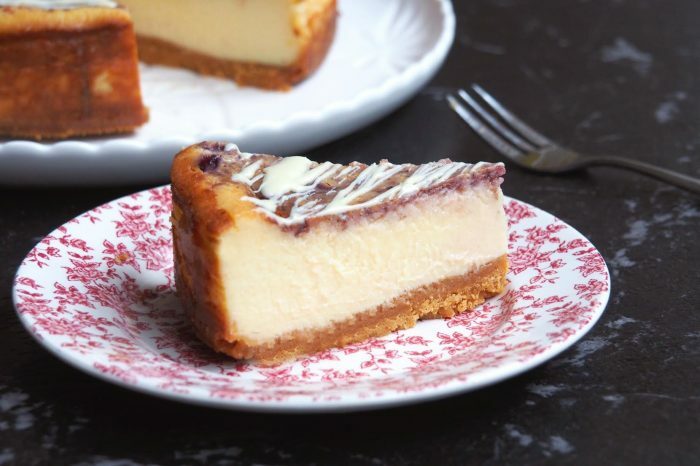 Just before serving, melt the white chocolate in the microwave in 30 second bursts until just melted and then use a teaspoon to drizzle it over the cheesecake. 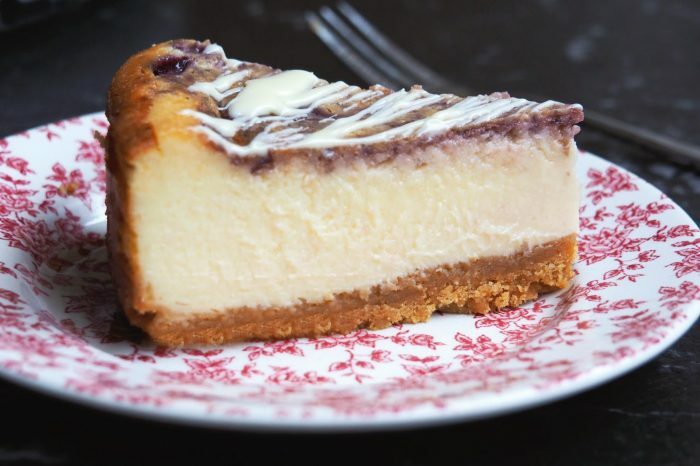 Cut the cheesecake into wedges and serve with remaining cherry puree and whipped cream. Place butter in TM bowl and melt for 3 minutes at 60C on speed 2. Check butter is completely melted. Add biscuits to TM bowl and crush for 15 seconds on speed 8. The mixture should have the texture of damp sand. Tip the mixture into the springform tin. Press the biscuit butter mixture into the base of the tin using the back of a spoon. Chill for 15 minutes, until firm. Add the cream cheese, ricotta, sugar, condensed milk, vanilla essence and eggs into TM bowl and mix for 30 seconds on speed 4 until smooth. Pour the mixture into prepared pan. Rinse bowl and add drained cherries. Blend for 20 seconds on speed 8 and again for 20 seconds on speed 6, until smooth. Using a teaspoon, dollop half of the cherry puree onto cream cheese mixture. Using a skewer, swirl it through the batter. TIP! Add 1 tablespoon cherry-flavoured liqueur to remaining cherry puree for serving. You can also use chocolate biscuits instead of plain ones for the base.